Butler is the author of Metamorphoses of the Vampire in Literature and Film, which has been mentioned on this blog before, and Luckhurst is the editor of a recent edition of Stoker's Dracula published by Oxford University Press. And the quote is from a recent article in The Sunday Times: The long life of the vampire by Toby Lichtig. The article also deals with a recent anthology titled Dracula's Guest: A connoisseur’s collection of Victorian vampire stories edited by Michael Sims, which, incidentally, has just been translated into Danish as Draculas Gæst: 22 af de bedste victorianske vampyrhistorier (Rosenkilde & Bahnhof). This to my knowledge is the first time a lengthy part of a text on vampires by Augustin Calmet has been translated into Danish. 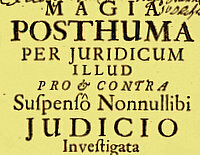 The part on Magia Posthuma is abbreviated, but the author and the title is mentioned. Unfortunately, the Danish translator has translated revenants in a way that, I think, does not make much sense in Danish. Still, I suppose it works alright as a (very brief) introduction to the subject.